A claim by the Department for Work and Pensions that jobseekers with mental health problems are not classed as vulnerable and may be sanctioned with impunity is false, documentary evidence has shown. Welfare Weekly revealed last week that JSA claimants with even the most serious mental health illnesses are not considered vulnerable by DWP. This has a knock-on effect when their Jobseekers Allowance (JSA) is reduced or stopped. In that circumstance, everyone can apply for a hardship payment totallying up to 60 per cent of their JSA, to help cover the cost of food and bills while they have no other means of support. Those classed as ‘vulnerable’ can normally claim this vital support immediately, but others may have to wait at least two weeks, and then go through what could be a lengthy application process. In the case of claimants with mental health problems, that two-week wait could be extremely dangerous. 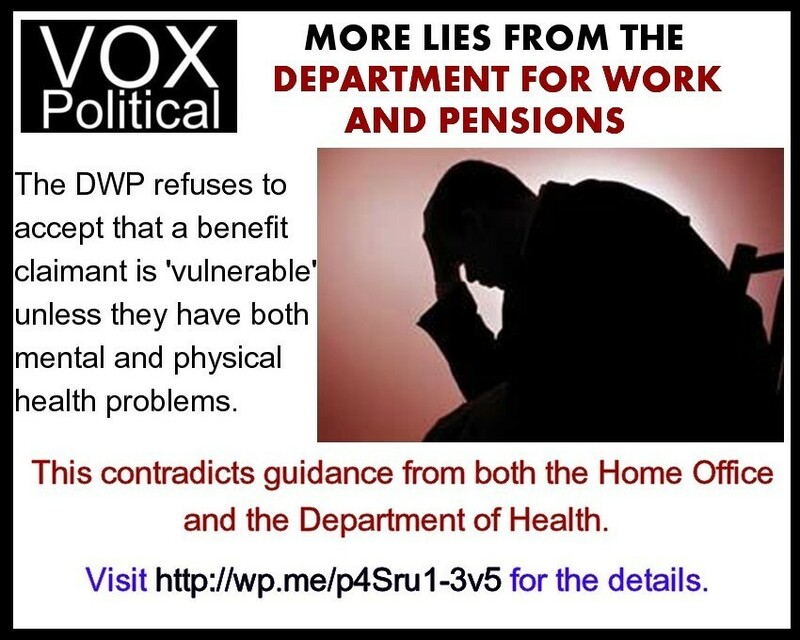 Vox Political has received information showing that both the Department of Health and the Home Office disagree with this definition – and the DWP has in fact made itself vulnerable to accusations that its own guidance is encouraging decision makers to abuse vulnerable adults. The Department of Health/Home Office paper No secrets: Guidance on developing and implementing multi-agency policies and procedures to protect vulnerable adults from abuse adopts and confirms a broad definition of a “vulnerable adult” from a 1997 consultation paper entitled ‘Who Decides?’, that had previously been issued by the Lord Chancellor’s Department. It defines a ‘vulnerable adult’ as a person “who is or may be in need of community care services* by reason of mental or other disability, age or illness; and who is or may be unable to take care of him or herself, or unable to protect him or herself against significant harm or exploitation” [bolding mine]. The paper adopts as a “starting point” for its definition of abuse, that it is “a violation of an individual’s human and civil rights by any other person or persons”. “Any other person or persons” includes officials working for the Department for Work and Pensions. It seems the DWP has a huge amount of explaining to do. Please publicise this widely and pass it on to anybody who is vulnerable due to mental health issues, along with anybody dealing with such people in a professional context (including carers). Everybody needs to know about this. Of course, anyone with serious mental health problems should be receiving Employment and Support Allowance rather than JSA, but of course the work capability assessment process used by the DWP is hopelessly inadequate at identifying people who need the alternative benefit – it was designed to be that way. Anyone affected by the DWP’s discrimination against the vulnerable should also consider campaigning against the work capability assessment. *For the purposes of this guidance ‘community care services’ will be taken to include all care services provided in any setting or context. Duncan-Smith is a devious, corrupt and dishonest individual who will wriggle and squirm to avoid taking responsibility for disgraceful policies. The man is a moronic cretin who, like many Nazis, were brutal people who were promoted for their brutal inhumanity way beyond their skills and capabilities. What “community care services” They don’t exist any more!! How odd: about 3 or 4 years ago BBC Panorama and various other TV shows looked critically at horrifying cases caused directly by the DWP/ATOS/WCA programme. The government said that it had “taken note” and would pay particular attention to people with mental problems. In fact the Mis-Government went on so much about how it would ensure that those with mental problems would be given special consideration that I wondered if that meant that PHYSICALLY challenged people would now bear the brunt of the Mis-Government’s hatred! Whatever the “one Nation for all the people Tories” say, you can be absolutely certain that they will do the opposite. Lying to a Court is called Perjury. I think Parliament needs its own Perjury laws. I can’t stress strongly enough how very dangerous this ruling from the DWP is. Stop all financial support and I will go without food, go without food and my anti psychotic and epilepsy medication becomes impossible to take. It states with the meds to take with food. I have been forced to take meds without eating for several days and I simply vomit. The meds don’t work. I become more ill and the vicious cycle begins again. This ruling is potentially lethal. When have the DWP ever told the truth? Welcome to my world.IDS/DWP have serious question’s to answer about their treatment of people with such condition’s.Yet more ethnic cleansing right infrort of the masses but they do not see it.When will this hatred end, will it ! Appalling. Mental health and vulnerability go together. The department for deceit sanctions sanction center plus lying again that’s a huge shock to me it’s not fit for purpose under George lying b*****d smith that was the c***’s plan all along!!! Moderate your language, please. This site aims to be accessible to everyone, including those who don’t want to see expletives and profanities dotted all over the place. We should not be surprised the mentally ill are once again targeted by the tory nazi party, they’re an easy target to aim and fire upon and it’s only going to get worse for them, be more suicides happening than there are already, people with mental health problems need help, better protection and support, but where can they turn to to get it with all their support structures being eroded away!